The good ole Oxford English Dictionary defines the word “clog”as a “thick piece of wood” or a “wooden soled overshoe.” Though they took the fashion world by storm in the 80’s they’ve been around since the 13th century. They’ve inspired dancing known as “clogging” and even the ever-classy tap dance owes its popularity somewhat to the clog. Now, the Oxford Dictionary has another entry that states a clog as “an encumbrance or impediment.” It also lists a clog as a verb meaning to “block.” However, this clog has never been embraced quite like the great pine loafers from Sweden. Nowadays, when we hear the word ‘clog’ we think clogged drains! No fun! 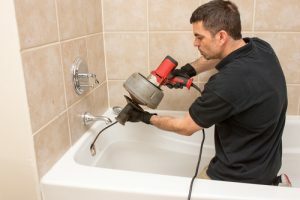 Plumber unclogging a tub drain with an electric auger. Improperly designed and installed plumbing may be why you are experiencing clogged drains or slow drains. 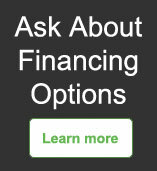 Therefore, if clogged drains are constantly plaguing you it could be a design issue. Both drain pipe venting and slope affect how well drains work. When an substantial amount of air is entering the vent, the water and waste will drain properly. For example, when you flush your toilet it will swirl and empty quickly when the air vent is installed and located properly. Clogged drains caused by a poor installation of a vent can cause odor and therefor distress to the homeowner. As long as teenage girls have been washing their hair in a bath, shower, or sink, subsequent clogging has occurred. Nowadays we might even have a Lhasa Apso rinse causing some minor blockage. There are many ways that hair can be removed from the sink. We do not recommend heavy chemicals that can damage pipes. Get your clogged drains cleaned out properly by calling a professional. Whether it’s a large industrial galley on an ocean liner or a small kitchen in a studio apartment cooking grease can wreak havoc on pipes. Wait for oil to cool after cooking and then dispose of it in the trash. Pouring oil into your pipes is a surefire way to cause clogged drains. Are you using your toilet as a typical bathroom trash can? If so, that may be the reason why your toilet is becoming clogged. People throw items meant for the garbage into the toilet and that will cause toilets to back up. Whether it’s feminine hygiene products, cotton-tipped swabs, dental floss, diaper wipes, paper towels, or food. Only throw toilet tissue down the toilet… everything else needs to go in the trash! After water, soap may be the one thing that washes down your drain most frequently. When combined with dirt, skin, hair, and other particles soap “scum” can a myriad of issues on your pipes. Many people think that soap will clean out the pipes but soap leaves an oily residue that causes clogged drains. Since hair is commonly the cause of many drain clogs, especially in showers and bathtubs, place strainers in those drains. And then make sure to clean them periodically. Be careful of things you wash down your sink. Motor oil, paint, lacquer, and wax can harden in pipes and cause clogged drains with severe blockage. Cooking oil, grease, or lard should not be wash down your kitchen sink. 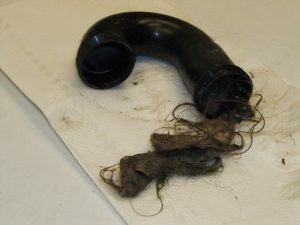 These items will cling to your pipes and cause other things that go through your pipes to grab ahold as well. To avoid clogged drains, make sure to put all used cooking fluids into a garbage can. Hair products like shampoos and conditioner often wash down a sink with no issue. Yet, if your washing out dyes or coloring products those can cause problems. These can leave a residue that builds up causing clogged drains. Running hot to boiling water immediately after using any hair substances will help to keep that build up to a minimum. There’s lots of things that should and should not go down your toilet. The only thing that belongs in a toilet other than waste, is toilet paper. Make every effort to place everything else in a trash can. A clogged toilet can be a real problem. Make sure to follow these tips to keep your pipes clear and running smooth.